Doesn't the 7.1 get output on a single digital cable? How would you input that into 7.1 inputs? When I have a LPCM 7.1 input into my receiver (AVR-X3400H), let's say from a ATV4k or PC or PS4 Pro, I am able to apply Dolby Surround and DTS:Neural:X to it. If I have a 7.1 speaker setup should I be applying these up mixers on the 7.1 input? What would they even be doing? Could they possibly be distributing the 7.1 input amount the 7.1 speakers better? Last edited by jdsmoothie; 04-15-2019 at 06:31 AM. Yes, but only if the audio is Atmos encoded. As suggested, press the MOVIE button (not the PURE(AUTO) button) to see if Atmos is one of the selectable surround modes. I have a UBD-K8500 feeding bitstream out to my X3400h that is driving a 5.1 channel system, and the X3400h will not use the ATMOS track. I don't see any reason why ATMOS shouldn't work with a 5.1 channel system (obviously I won't get the full benefit, but I want the highest quality signal getting to the AVR). All I have when I press the Movie button is various Dolby TrueHD modes, not ATMOS. The X3400h sounds amazing, but I'd really like it to accept ATMOS, since I have paid for movies, a player, and an AVR that all support it. Atmos is just Dolby TrueHD but with the spacial speakers encoding. Atmos will only be enabled when you have a 7.1 system and change it to a 5.2.1 system. Ok thanks, good to know. If you are only driving 5.1 channels now with your X3400h and you are not using your other 2 channels for a zone 2 then should have 2 available channels for Atmos. 2 more speakers configured (and positioned) will get you to the missing ".2" of a 5.2.1 Atmos configuration. "You keep using that word...I do not think it means what you think it means." With all these 5.1 and Atmos discussion, and missing the "spacial encoding" from the Atmos soundtrack on a 5.1 system, I'm just curious (sorry if it's a stupid question...hopefully you guys are under the tenet of "no stupid questions"...), what if the 2 surround speakers were simply switched to the "surround back" speaker inputs instead? I've read that surround backs and other surround back-like speakers only account for something like less than "10%" of the sound signal, so (now that I'm thinking about it), would moving the last 2 speakers to the surround backs give you a loss from whatever percentage of the sound signal the side-surrounds give to the mere lower than 10% -- albeit a superior "cooler" "spacial encoding" -- or would the receiver somewhat detect this and somehow send it properly picking up the "slack"? Or would the Denon simply detect the "trick" and still not offer the Atmos option/selection and just treat it as surround-sides regardless...? So we are all speaking the same language - using an example of my 7.2.4 ATMOS setup, the first number “7” represents the main speakers arranged in the listening plane, so Left, Right, Center, Surround Left, Surround Right, Surround Back Left, and Surround Back Right. The second number “2” represents the number of subwoofers. The last number “4” represents the number of ATMOS height speakers. So in your example, unless he is changing the number of subwoofers, he would be going from a 7.1 system to a 5.1.2 system. Then you would get an error when doing the Audyssey setup. In a 5.1 setup, the surround speakers must be connected to the "SURROUND" speaker posts (even if they are physically placed behind the MLP). simplepinoi177 and ahblaza like this. If the Atmos audio track is selected on the source, then the Dolby TrueHD that is being received by the AVR includes the Atmos metadata. As stated previously, unless there is a configured 7.1 or 5.1.2 setup, Atmos won't be displayed. I have a 4400, which has nine speaker amps, and two pre-outs for subwoofers... so I have a 5.2.4 system. If I turn on Zone 2 for sound/video in the kitchen, my AVR can NOT send Atmos in the movie Room. It sends 5.2 audio out. If I shut down zone 2, the needed amps for Atmos are available again and the movie causes the AVR to display “Atmos” instead of “Multi-Channel In and DD+” or just “Dolby Surround”. Scared the pants off some friends who completely freaked at the sounds of the invader species running across the floor above us. It really did sound like it was upstairs. Setup: Mostly plebeian, but carefully curated. HA! I was wondering about that! I should've read more carefully...but I honestly just chalked it up to him downgrading an Atmos speaker and inputting another sub... ! In a 5.2.2 setup, ideally, the Top Middle speakers are placed above and about 1-2' forward of the main listening position. Sorry, it should be a 5.1.2 system. I mixed up the numbers. JD. I notice that you mention that Atmos can be displayed (on my X6400H, or maybe any of the recent Denon models) if there is a 7.1 setup detected. That is in fact what I have. 7.1 and the receiver showing ATMOS when it is in the source. My question is whether the receiver is doing anything different in processing the audio for ATMOS encoded content for the 7.1 setup than it would if it were TrueHD in 7.1.Meaning I guess is there any object oriented processing going on. Is it doing anything with that metadata, or just showing me that it is there? I have heard some impressive surround sound from the system on tracks that are in Atmos. I am not sure if this impression that they sound better than "plain" TrueHD, is due to anything real in the processing, they are just good sound tracks with excellent positional information in the 7.1, or if I am suffering from expectation BIAS. Of course, the fact that the receiver displays ATMOS in this configuration would lead me to think that it is doing something different with ATMOS encoded material.. I have spent some time searching to see if there is any data about how ATMOS is processed in a 7.1 system, or if it is at all. But, I have come up empty. Any links or just expert knowledge will be appreciated. Last edited by ppasteur; 04-16-2019 at 11:30 AM. JD. I notice that you mention that Atmos can be displayed (on my X6400H, or maybe any of the recent Denon models) if there is a 7.1 setup detected. That is in fact what I have. 7.1 and the receiver showing ATMOS when it is in the source. My question is whether the receiver is doing anything different in processing the audio for ATMOS encoded content for the 7.1 setup than it would if it were TrueHD in 7.1.Meaning I guess is there any object oriented processing going on. I have heard some impressive surround sound from the system on tracks that are in Atmos. I am not sure if this impression that they sound better than "plain" TrueHD, is due to anything real in the processing, they are just good sound tracks with excellent positional information in the 7.1, or if I am suffering from expectation BIAS. Of course, the fact that the receiver displays ATMOS in this configuration would lead me to think that it is doing something different with ATMOS encoded material.. I had this question, if someone can answer it. X3400 and x3500 have the same specs except that x3500 has a phono input. But x3400 is selling for almost half the price of X3500. I understand that the x3400 is a 2017 model but if the specs are same what difference does it make. Are there other problems that people are reporting with X3400? but I appreciate the education none-the-less...! I have two more speakers to make it 7.1, but I don't have in-ceiling or ceiling bounce speakers for Atmos. I'm currently in an apartment, so the 5.1 system with the X3400h driving it is already more than the apartment can reasonably handle without annoying the neighbors, but so far the system has been great. I use it mostly for TV/streaming, but occasionally watch a UHD Blu-Ray. I got the X3400h for the dual zone capability and expandability. If I build out a dedicated HT, I will use the X3400h for the living room with a 7.1 setup and get an x4400h or x4500h for the HT for a 7.2.4 setup. 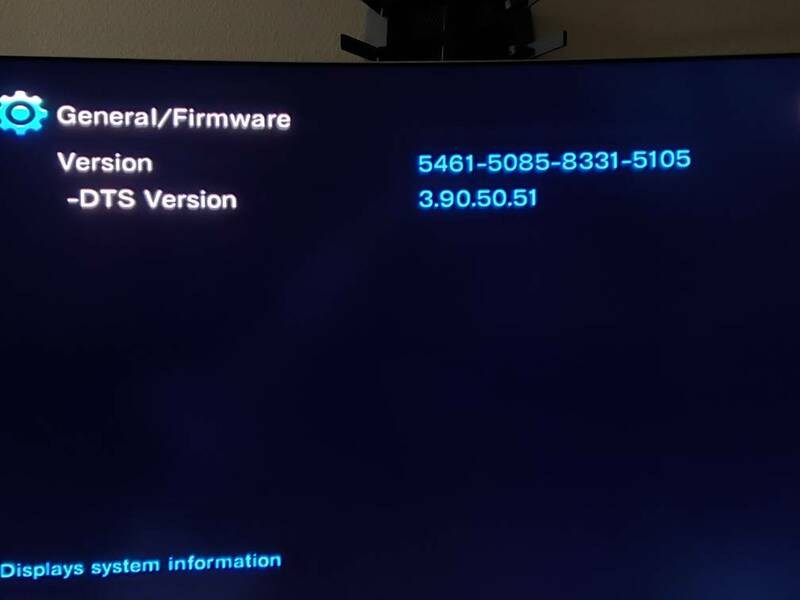 Although I absolutely love my 3400 and would recommend it to anyone, I will mention that I have had (and then upon further research, found that it is widespread as it seems to affect Denon/Marantz and even Onkyo brands) issues when it comes to HDMI handshaking issues between at least this receiver and Samsung TVs (and possibly including PS4 Pro & XBOX One S) where the bug seems to have issues with full 4:4:4 color space and/or 2160p at 60Hz. Interesting. I cannot get my Roku to go 4k60p HDR through the AVR, but it will do it when connected directly to my Samsung JS850D. It will do 4k30p HDR or 4k60p non-HDR, which is annoying, but I haven't bothered troubleshooting it, as I'll probably move in a few months anyway. Unfortunately, HDMI seems to be inherently buggy, probably due to the fact that there are many different bandwidths, frame-rates, resolutions, color depths, etc, offered through it. Thanks and the funny part is that I am also planning to buy Samsung UN75NU8000 TV. my HDMI cable needs to be 15 ft long and goes through inside the wall to reach to the back of the TV. What cable would you recommend for this application? But yeah, you might want to do further research on cable length and 18GB 4k signal correlations. Does anyone know what this new update is for? simplepinoi177 and mrtickleuk like this. Last edited by camd5pt0; 04-16-2019 at 10:56 PM. For those of you with a sub (or subs) capable of going <20Hz, a recent update to the MultEQ Editor app has now removed the 20Hz roll-off resulting in much more pronounced lower bass response. mjwagner and simplepinoi177 like this. mjwagner and camd5pt0 like this. Just got the same update. I don't notice anything different. 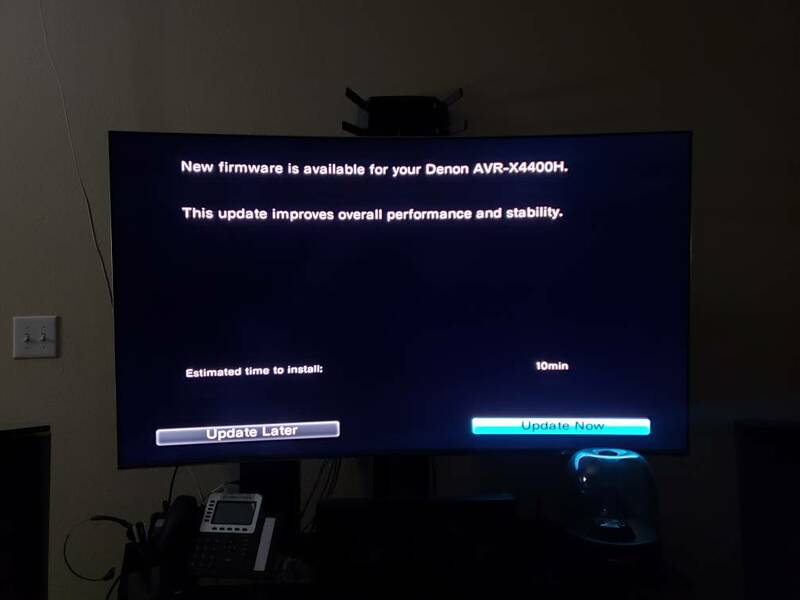 I just updated firmware as well as I was greeted with the "update available" message when I turned on my X4400H this afternoon. After doing the update, I also had to update my other HEOS devices before it would let me connect to the X4400H and play music. In addition, I noticed something did not sound right after the update while playing FLAC files (stereo / 2 channel) using BubbleUpnP (online music?). Music sounded brighter than I thought it did before. After checking settings, I found the culprit: [Setup / Audio / Restorer / Mode] had been set to "Low" after the update. I do not use this feature and set it back to "Off". All is well again. This is not the 1st time this has happened after updating firmware. Others may want to check as well. Edit: I was playing a concert via Blu-ray tonight and noticed the audio and video were not in sync. 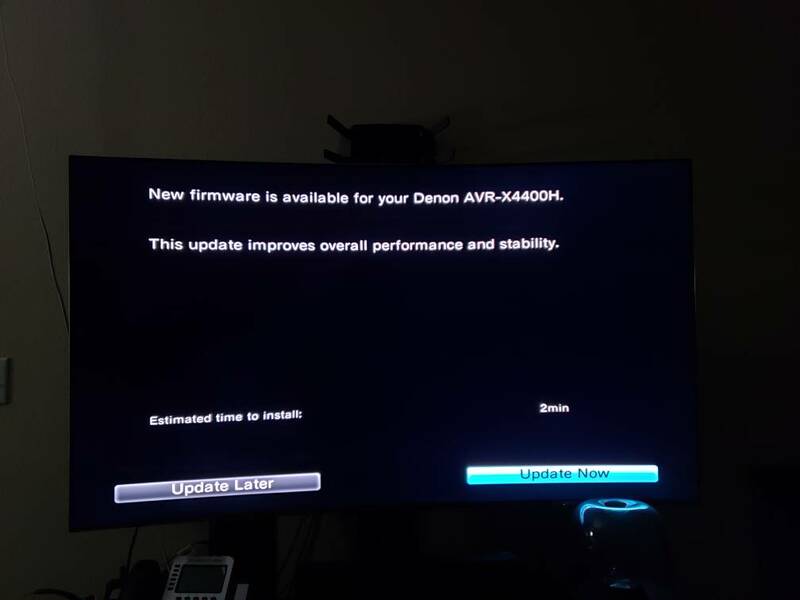 Denon strikes again with the firmware update. The audio delay (Setup / Audio / Audio Delay / Adjust) had been reset to 0 ms. I had it set to 130 ms before the update. Annoying, but 1st world problems I guess. Last edited by Ralps; 04-18-2019 at 04:21 PM.